Life can't be ALL green smoothies and turkey buyers. Sometime (just sometimes) you have to throw caution to the wind and give in to those evil voices. Bacon Cheeseburger with Caramelized Onions? Hello, lover. On Saturday night, we had a group of friends over and hosted our first official grill-out of the summer. Yes, I'm totally skipping ahead to summer—I can't help it. I'm so excited! We decided to skip our usual Turkey Burger menu, not because we don't LOVE them, but because we have served them to our friends so many times that it was most certainly time for something new. We put out an assortment of toppings including bacon, caramelized onions, sriracha sauce and avocado. Everyone had a blast making their own ultimate burger and we had a contest to see who could pile theirs the highest. 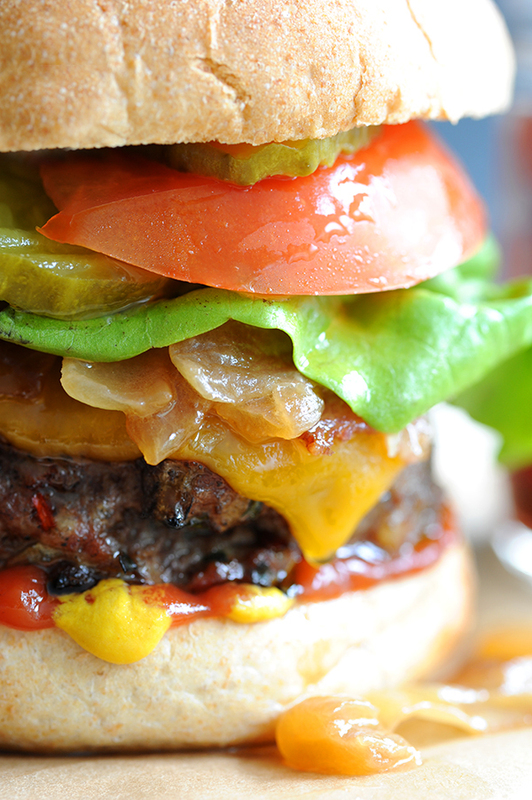 These burgers are so juicy. They are simple and perfect for a warm summer night with good friends. 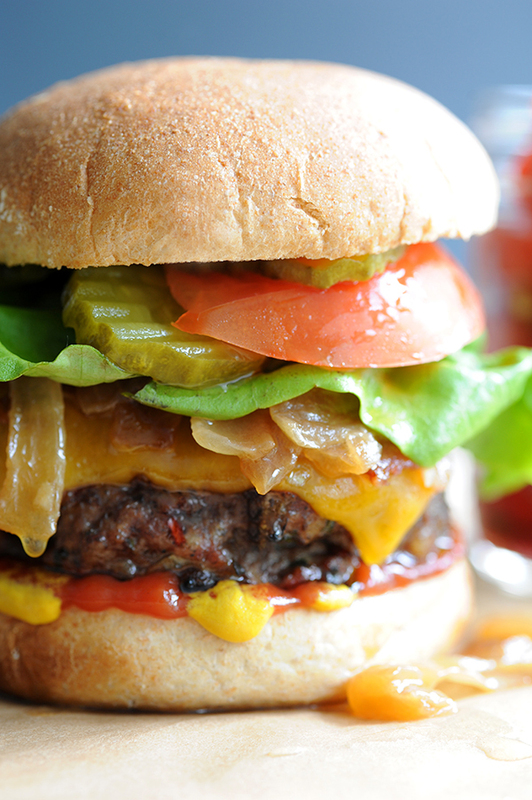 Mix all ingredients together and form 4 large patties. Set outdoor grill for direct-heat cooking over medium-high heat. Place patties on grill and cook for 5 mins, turn and continue cooking until done. A minute before you finish cooking, lay Cheddar cheese on top of each patty and cook until melted. 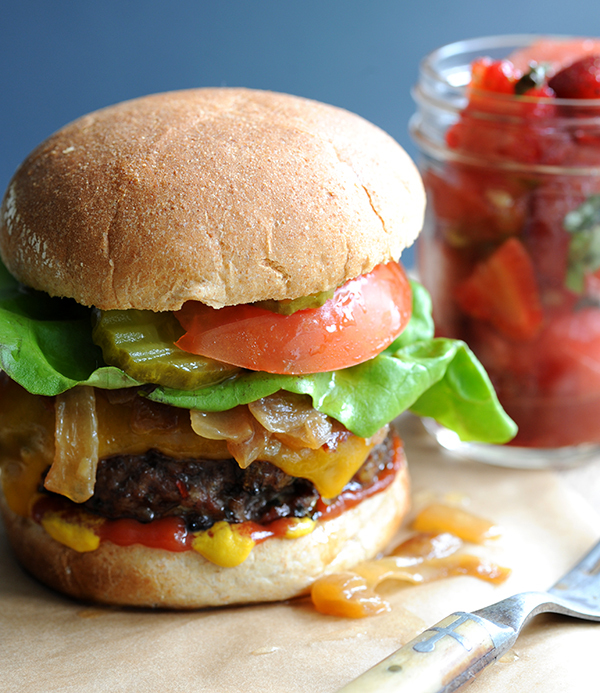 Serve on toasted fresh hamburger buns with caramelized onions, bacon, ketchup, mustard, sriracha sauce, pickles, lettuce, tomato and avocado. 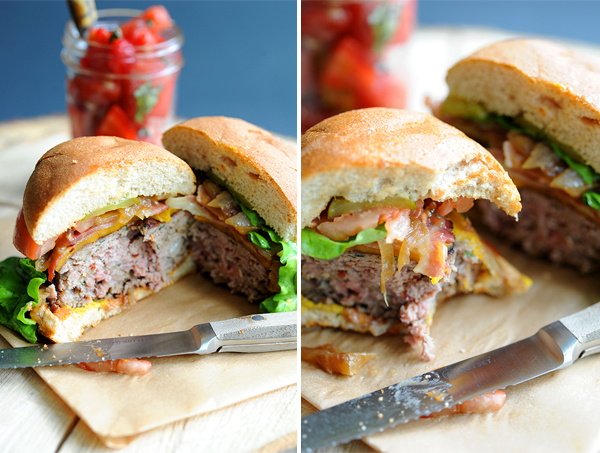 I love to serve these decadent burgers with something like a Watermelon and Strawberry Salad. It's nice to have a side that is light and refreshing to compliment the burgers. To make this Watermelon and Strawberry Salad, toss together sliced watermelon, strawberries, julienned basil, lime juice, balsamic vinegar and sea salt.